A free, designated public parking area is located in lot SC40 to the left of the railroad trestle off of Kingston Pike in front of the Kingston Pike Building (2309 Kingston Pike) on Metron Center Way. A complimentary, direct bus shuttle service will provide quick transportation to the Goodfriend Indoor Tennis Center. 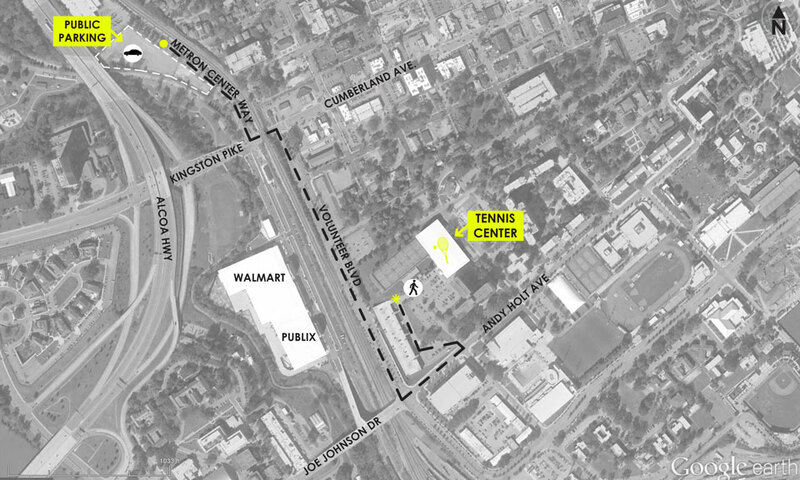 Directions to the Goodfriend Indoor Tennis Center from West Knoxville via Kingston Pk. Head east on Kingston Pk. toward Cumberland Ave. Turn right onto Volunteer Blvd. Turn left onto Andy Holt Ave. Directions to Public Parking from West Knoxville via Kingston Pk. Head east on Kingston Pike toward Cumberland Ave.